Pune’s designer Sachi Sabhrewal has a unique mind. Scrolling through the Instagram page of her label, Sach - infinitely creative, we came across five outfits we loved. They are unique, have an Indian flair and we’re surely going to dial Sabhrewal so that she could recreate them. 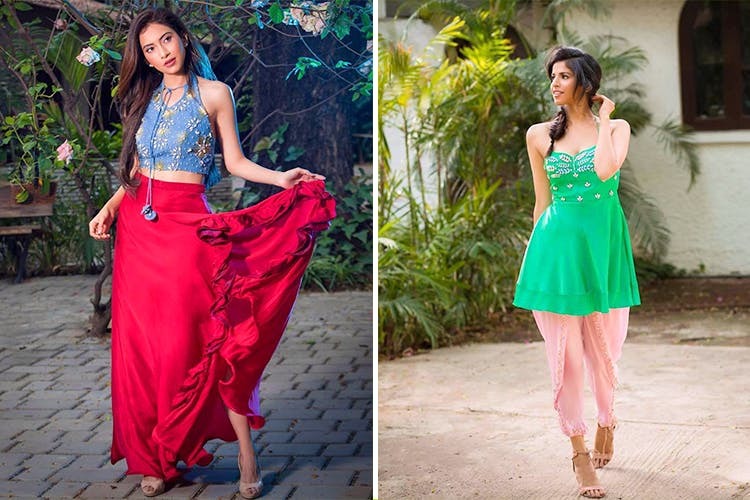 Starting at INR 5,000 you can get an outfit of your choice or get one of these looks. This simple dual green barfi silk kurti can be worn as a dress too. With minimal embellishments, this would look great over pants or a skirt or like the model, rock it as a short cocktail dress. Blue and red always complement each other. This embellished denim crop has details like a front tassel. It has a lot of bead embroidery giving it a westernised choli look. Paired with a red skirt with a thigh-high slit that has ruffles, it’s the perfect indo-western outfit. We love midi dresses! They’re versatile and you can wear them even to work. This Indian midi tapers at the end and the bust is embellished with kashti, nakshi and salli stones. The stone work gives it an ethnic look. The ochre dress with a greyish-blue bottom gives it a comforting and easy-to-slip-into feel. If you want to stand out at a wedding and look like you know all about style, slip into this outfit. The red off-shoulder dress has a dhoti-like wrap in the front, but pair it with the lime-green waistcoat that’s heavy on embellishment, it looks like indo-western wear. This outfit is an ideal investment! You can wear just the dress or rock it with the coat. Tiered skirts and gowns became a big hit in 2018. The trend continues, so you must get this mustard yellow tiered skirt that you could honestly pair with so many crop tops from your wardrobe. But when you have a social event, bring out this denim crop top with beaded embroidery and look like a fashionista.